Los Angeles residents (and residents of surrounding areas) can now be prepared before an emergency strikes thanks to the Los Angeles Emergency Management Department. The LA EMD continues to provide proper education, made accessible to residents on www.readyla.org. This website acts as an optimum resource when seeking guidance in conduct during potential natural disasters. Please take a moment to subscribe to text updates here on Notify LA and you will be notified via text, email or voice message during times of emergencies and disasters, or can text NOTIFYLA to 888-777 for updates – easy breezy! We often forget that a natural disaster could strike at any time, completely uprooting our day and potentially our lives. If we are thoroughly prepared we can continue our days with ease and more so entirely enjoy our desirable Southern California climate, beautiful beaches, rugged mountains, and diversity in arts. Earthquakes, fires, flash flooding, severe weather, landsides, power blackouts, tsunamis, terrorism, cyber security, public health, hazardous materials, and transit safety are all among the many concerns the Los Angeles Emergency Management Department addresses for local residents. Help to put your mind at ease and develop a household disaster plan for your family. If you have children, ask them to help you prepare – involving family, especially young children, can be a fantastic bonding experience. First, create a checklist. You can contact your local emergency team directly if you have any questions. Ensure that you have sufficient water and food supplies to nourish your family during times of emergency – loss of Internet and phone service, and inability to travel for aid. Double check that all smoke and carbon monoxide detectors have batteries and are properly installed. Choose a known meeting ground (and have a second location just in case) that your family will reunite if a separation occurs. Teach your children how to call 911 in the case of an emergency. Ensure that all emergency numbers are properly inputted into all phone devices and a hard copy is placed on the refrigerator. Store an emergency kit in a safe and memorable area. Ensure that all family members are aware its location and how to use it. Visit Ready LA for a complete emergency plan. Also, be sure to own a fire extinguisher and keep it in a safe place – away from children. 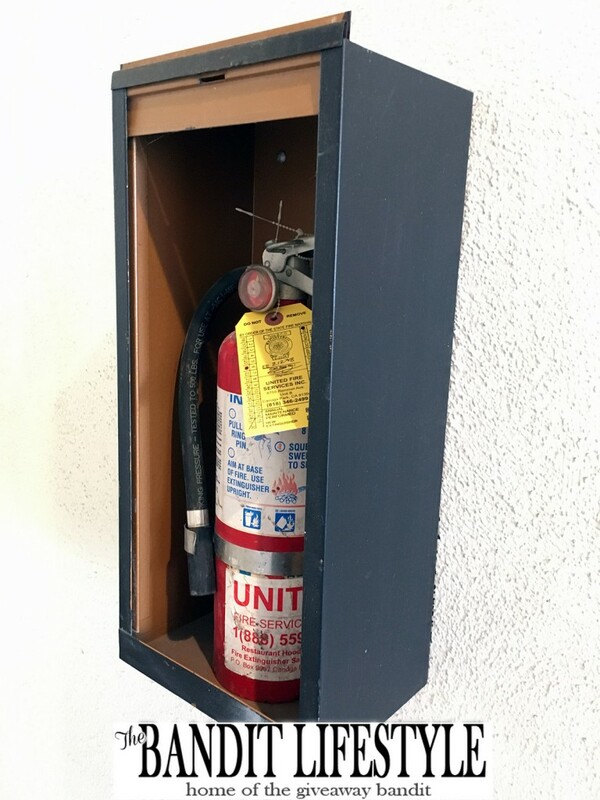 If you live in a multi-family apartment building ask your landlord where the nearest fire extinguisher is kept. This info could come in handy! When it comes to owning an emergency supply kit, you can purchase it from your local Red Cross store or build your own! Think of it as another DIY, but this time you will be creating something that may save your family in the case of an emergency – think Martha Stewart meets MacGyver! 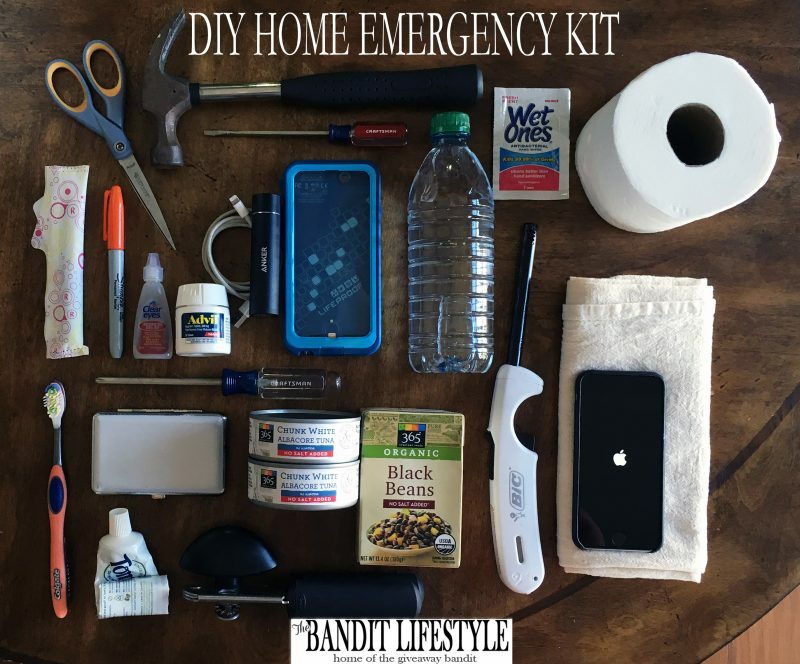 Below is an example of a DIY Home Emergency Kit I was able to put together with items I already own. You can too!!! Included below: scissors, hammer, flat head, hand wipes, toilet paper, tampons, bright sharpie, eye drops, Advil, portable/wireless cell phone charger & cord, cell phone charger case, water, lighter, toothbrush, toothpaste, screw driver, small first aid kit, canned tuna, can opener, boxed or canned black beans, towels, and your cell phone. A few additional suggestions include: a whistle, infant formula and diapers (if you have a baby), local maps, breathing masks, rain ponchos, tape, retractable knife, a backpack, prescription medications, and canned juices. You can view a full list of suggestions here. Invite your children to help you create your family’s supply kit, giving each child a specific duty. This will create a sense of pride in your children. Most of all – have fun! Being prepared can be an enjoyable and educational experience for the entire family.